Introductions. Meeting many new people. Orientation groups. Taking part in big welcome lunches. First days at any job can be overwhelming and intimidating. That's true for anyone—but introverts, who tend to gravitate toward one-on-one situations, and away from big groups, may find the idea of starting a new job particularly intimidating. Discover strategies that will help make your first week at a new job a success, whether you're introverted, a bit shy, or just feeling nervous about beginning a new role. Say Yes—But Not Too Much: It may feel tempting to opt for one of two extremes: saying yes to every invite, from drinks to coffee to a welcome lunch to joining the office's softball league or declining all invites. Aim to find a happy medium: say yes to things that work well with your personality, and turn down activities far outside of your comfort zone. If you despise sports, go ahead and demur the softball league gathering. Do attend your own welcome lunch, of course, and aim to join at least a couple of the work-related social activities that you're invited to. Be careful not to overbook yourself—if you say yes to a work event on a Monday, give yourself Tuesday and Wednesday nights off. Aim for One-on-One: As much as possible, steer social interactions with colleagues toward small gatherings. Invite peers to coffee, or join a small group for lunch. 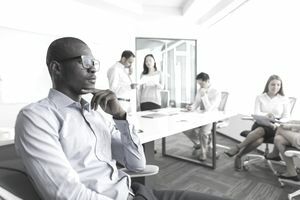 There's likely no tactful way to opt out of a large welcome lunch or a required orientation for new hires, but even there, you can try to focus your attention on just the people sitting around you. Even if you're part of a large group, you can still make it small by speaking to only one or two people at a time. Prepare Your Intro: Being on the spot can be an uncomfortable position for introverts—or anyone, really, who doesn't adore being the center of attention. Before your first day at a new job, try to imagine and plan ahead for likely scenarios, such as introductions at a team-wide meeting. Practice how you'll introduce yourself, from sharing hobbies and personal details to providing an overview of your work history. Take Time for Yourself: Can you develop a work-from-home schedule for a day a week? Do you have an office door you can close? These types of perks can be luxuries, especially for early-career employees. Develop other ways of giving yourself solo time outside of the office, to refresh yourself from big meetings and constant chatter nearby. If it works with your schedule, you can arrive at work early or depart late. Or, just find a nearby park or coffee shop to visit for a few minutes of solitude. Share Your Preferred Work Style: There's no need to make a big deal of it, but feel free to relate your work style to co-workers, or your manager. You can even mention it casually in your introduction, by commenting that you're while you tend to be quiet during big meetings, you love to connect one-on-one.